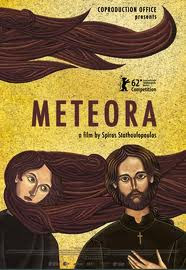 Meteora (Greek: Μετέωρα) is a 2012 Greek drama film directed by Spiros Stathoulopoulos. The film competed in competition at the 62nd Berlin International Film Festival in February 2012. The film takes its title from the Byzantine monastery complex Meteora, in Thessaly, a series of structures built on natural sandstone pillars. The film follows an illicit romance between a Greek Orthodox monk and a neighboring nun. It is slow in pace with little dialogue, taking its time to present the scenery for all its worth with realistic cinematography. Read a review from The Hollywood Reporter here to get an idea of what to expect in this film.